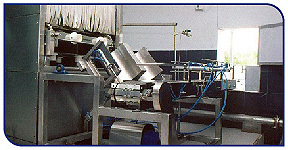 Fully automatic bottle loading system to load water bottles from infeed conveyor to bottle holder. Advanced robot pneumatic system combined with optical sensor makes the loading process reliable and efficient. Specially designed Nylo-Brussel Scrubber are provided in combination with angular sprays to wash the outer surface of the bottle. The scrubber is so designed even to clean the external neck area. Stainless steel sanitary high accuracy filling valve are used to achieve even filling in all mineral water bottles. Specially designed high pressure and low pressure filling cycle is provided with PLC control. 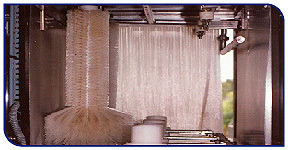 Stage of washing is available from 3 to 11 depending upon customers requirements. Wash water recycle tank as well as 5/5 dust bin are provided in the washing segment. Specially designed Nozzles with angular 0° to 15° ensure efficient internal wash of the bottles. State of art PLC is used with LCD display screen to control the machine. This system control important functions like Wash Time, Fill Time and Conveyer ON/OFF Time and also provide detailed fault detection features. 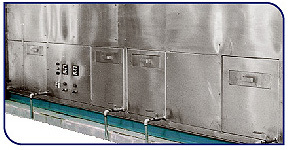 Built in clean room features with HEPA sub micron filter can be provided on request. 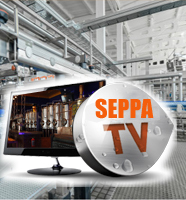 SEPPA Private Limited incorporates State of art technology in design engineering of the system being manufactured. 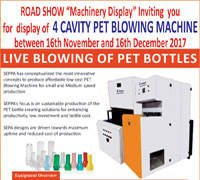 The SEPPA 1000 PLC series consisting of 2 BPM to 24 BPM range has been specially designed and manufactured for 10 to 25 liters poly carbonate / PET Bottles. 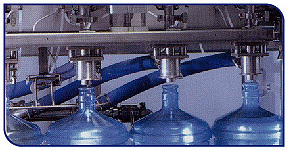 The mineral water bottles are fed into an automatic robot arm which tilts the bottle on top of high pressure spray which washes the bottle in 3 to 11 stages (Washing stages vary depending on quality request). 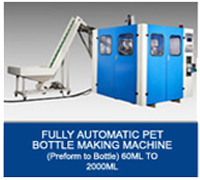 The SEPPA Private Limited 1000 PLC series is designed to wash, scrub, fill and cap the bulk bottles.